Automatic turning of staple goods for packing in telescope cartons. Turning of products such as brochures that are delivered with the front page down. 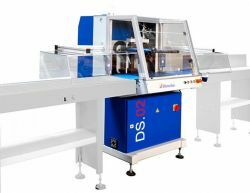 With the turning station DS.02 stacks of printed materials can be turned within a continuous production flow. The machine is designed for use between conveyor belts, roller conveyors or similar. When packing in telescope cartons the bottom part of the carton is drawn over the stack at first. The turning of the semi-packed stack is made by the DS.02. Then the machine passes it on a conveyor belt on which the lid is drawn over and is furthermore transported for palletizing. The machine is also suitable for other applications, e.g. turning prior to a shrink wrap tunnel.